Mission Manager ensures team readiness by providing the right information to members at the right time. It helps with the day-to-day management of documents, timekeeping functions, event scheduling and much more. Mission Manager can serve as your team’s repository for operating plans, policy and procedure manuals, and equipment operating manuals – along with a variety of forms, training materials and other documents, both general and mission-specific. 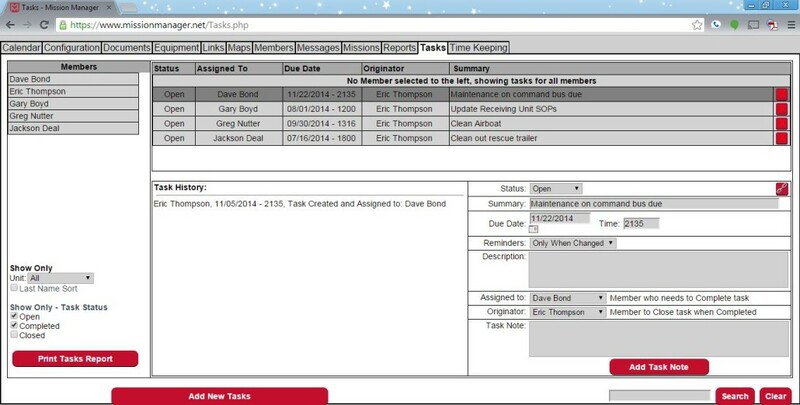 Administrators can assign tasks such as equipment maintenance, training programs and public relations activities to individual team members, and then track their progress via the task notes. A web-based team calendar helps teams organize events, including training, public relations activities or meetings. The users can set up events with automated RSVPs and email reminders, simplifying attendance collection for teams. An event sign-in sheet can printed, which includes names of those who have confirmed their attendance. After the event, a timekeeping entry will automatically be added to the member’s screen. The timekeeping function allows users to enter their time and mileage spent on each task. For monthly reports, the system will generate an automatic email that reminds each team member to login and enter their hours concurrent with their activities. The team member selects the date for each activity, the miles driven, the number of hours spent, the category for the hours and description of the activity. This simplifies the end-of-the-month reporting process, as it allows administrators to generate team totals for each category.